ORIGINAL AND RARE WW2 U. ARMY "RANGER" DIAMOND SHAPED UNIFORM PATCH. 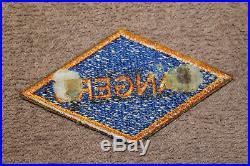 PATCH IS IN VERY GOOD CONDITION, SHOWING LIGHT WEAR, AGE AND HAS TWO OLD PAPER AND GLUE SPOTS TO IT'S BACK SIDE AS THIS PATCH WAS REMOVED FROM A VETERANS SCRAP BOOK. RARE ORIGINAL PATCH TO FIND THESE DAYS. The item "Rare Original WW2 U. 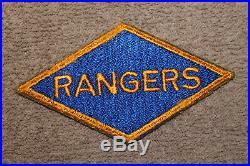 Army Ranger Uniform Patch from Scrap Book" is in sale since Monday, March 11, 2019. This item is in the category "Collectibles\Militaria\WW II (1939-45)\Original Period Items\United States\Patches". The seller is "ww21941" and is located in Buffalo, New York.